a $100 Prize (THIS) or a $25 Gift Certificate (THAT). Visit each blog and enter to win them all! CoffeeMarvel has just introduced a brand new line of cocktail-inspired teas, calorie reduced hot cocoa, and Rainforest Alliance-certified coffees under Bethenny Frankel’s popular Skinnygirl line. Skinnygirl single serve beverages contain no artificial flavors, colors, or sweeteners. All are compatible with the Keurig single serve brewing system. I received a package with four tea flavors and two coffee flavors to try them out! There are four fabulous Skinnygirl Tea flavors - Peach Bellini Green Tea, Sangria Hibiscus Herbal Tea, Mojito Mint Green Green, and Cranberry Cosmo White Tea. I like to brew them in my single serve brewer, then pour them over a tall glass of ice. In the evening, I like to add a dash of sparkling wine to turn them into real cocktails. These new flavors are so delicious and refreshing! Skinnygirl Coffee flavors include Half Caff Medium Roast and Americano Espresso Roast. The Americano is a deep rich flavor, simply perfect for those cold mornings, and the Half Caff is the perfect after-dinner coffee. Skinnygirl also makes a reduced-calorie Hot Cocoa in a single serve cup! I absolutely give my stamp of approval to Skinnygirl teas and coffees! The single serve beverage cups are so convenient since I work at home alone. Plus, I save all the used beverage cups to plant my seeds indoors over the winter. 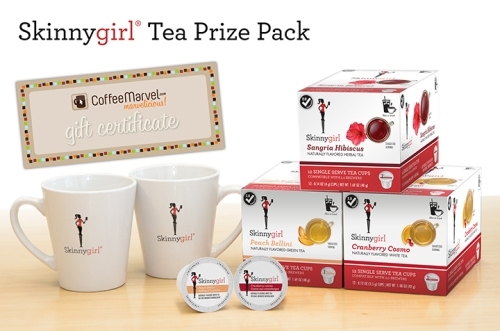 Shop at www.coffeemarvel.com for the new Skinnygirl tea, coffee, and hot cocoa single serve cups, and check out all their other great products too! I definitely want to try the peach bellini flavor first, it sounds really good. I ama huge fan of peach anyway. Thank you. I want to try the SANGRIA HIBISCUS tea. I would definitely try the Sangria Hibiscus tea first! The first one that I would try is the Skinnygirl Cranberry Cosmo White Tea. It sounds delicious. I would try peach bellini first. I would love to try the Cranberry Cosmo White Tea. It sounds really good. Thanks for this chance and I would love to try the White Tea. It sounds delicious. I would try the Mojito. I would try the cranberry cosmo white tea. Mojito mint green tea would be nice. I would like to try the Cranberry Cosmo first. The hot Cocoa would be really good too. Skinnygirl Peach Bellini Green Tea. I think the Cranberry Cosmo sounds delicious! I would like to try the Peach Bellini Green Tea. The Mojito Mint Green Tea sounds fantastic. First I'd try the Mojito Mint Green Tea. I would love to try the Hot Cocoa! I'd be all over that Peach Bellini Green Tea. I like peach. The MOJITO MINT sounds delicious. Thanks for the giveaway! I would like to try the SANGRIA HIBISCUS flavor. Thanks for the chance! I really like the sound of the mojito mint sounds delish. Calorie reduced hot cocoa! Or the peach bellini sounds amazing too! Depending on the time of the year. I would love to the Mojito Mint Green tea but the Cranberry Cosmo sounds refreshing too!!! I would love to try the Mojito Mint!! YUM!! I would love to try any of them especially MOJITO MINT. Skinnygirl Cranberry Cosmo White Tea it sounds so good they all do. I would try peach bellini . I love the sound of all the flavors though. Skinnygirl Peach Bellini Green Tea!!! I'd like to try the MOJITO MINT first. The Peach Belini Hibiscus Green Tea sounds really good! I would love to try the cranberry cosmo. Sounds like a flavor I would enjoy. I'd love the Hot Cocoa. I'd try the Skinnygirl Calorie Reduced Hot Cocoa first! Cranberry Cosmo White Tea sounds delicious! I want to try the Sangria Hibiscus Herbal Tea! I would like to try the Hot Cocoa. Thank you for the entry. Yum! I'd love to try the cranberry cosmo. L want to try the Mojito Mint Flavor! I would try the PEACH BELLINI tea. I would like to try the Skinnygirl Peach Bellini Green Tea. Cocktail Inspired Herbal Tea first and foremost.